Let's take a look at the Readings for Pentecost Sunday Mass during the Day. We have already remarked (in the post on the Vigil readings) on the intimate relationship between this event and Babel (Pentecost is the Un-Babel) and Sinai (Sinai is the giving of the Old Law for the Old Covenant; Pentecost is the giving of the New Law of the New Covenant). It is important to note that the congregation gathered around the apostles comes not only from a wide variety of nations of the earth, but also consists of “Jews and converts to Judaism.” In other words, there are both ethnic Jews and ethnic Gentiles here: those who hear the apostles are truly a representative cross-section of humanity. (1) the close association of the giving of the Spirit with the ministry of Peter, the spokesman to and for the Body of Christ. One of the goals of the Church is the reunification of the human family. Denominationalism and nationalism among non-Catholic Christians defeats this goal. Like him or not, the successor of Peter remains the central figure of world Christianity. All Catholics are united in their fidelity to him, and the only thing that unites all non-Catholics is their opposition to him. Thus he is the great unifier. 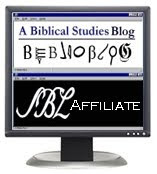 See this article by Protestant theologianStephen Long. (2) The close association of the giving of the Spirit with baptism, and by extension the sacramental ministry of the Church: “Repent, and be baptized every one of you in the name of Jesus Christ for the forgiveness of your sins; and you shall receive the gift of the Holy Spirit” (Acts 2:38). (3) The correlation of the worship of the early Church and Mass: “And they devoted themselves to (a) the apostles’ teaching and (b) fellowship, to the (c) breaking of bread and the (d) prayers (Acts 2:42).” This is a perennial description of the life of the Church. We see all these same elements in the Mass, respectively, in (a) the readings and homily, the (b) passing of the peace, (c) the Liturgy of the Eucharist, and (d) the Collect and the Eucharistic Prayer. St. Luke records the life of the early Church in such a way that we can recognize our continuity with them, because we are the same Body extended in time. The Responsorial Psalm is the same as that for the Vigil. See my comments on the vigil below. What does it mean to say “Jesus is Lord?” Remember that Jews like Paul did not pronounce the divine name (YHWH) but substituted adonai in Hebrew and kurios, “Lord,” in Greek. The fullest sense of proclaiming “Jesus is Lord” is to identify him with the God of Israel who revealed himself to Moses. Further, Paul’s statement that “No one can say Jesus is Lord except by the Holy Spirit,” reminds us that Pentecost, while a extraordinary event, is not the first bestowal of the Spirit on mankind. The Spirit has been active since Creation. Particularly, a careful reading of the infancy narratives of Luke 1-2, to mention just one example, shows how active the Spirit was even before the earthly ministry of Christ. St. Paul’s statement implies that the Spirit was already active upon certain individuals who confessed Jesus as Lord in the Gospel narratives (e.g. Matt 15:22, John 20:18,28). 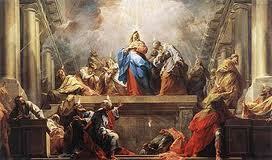 Pentecost is the coming of the Spirit as “power from on high” (cf. Luke 24:49), but by no means is it the debut of the Holy Spirit in salvation history! St. Paul goes on in this reading to discuss different spiritual gifts, stressing that “to each individual the manifestation of the Spirit is given for some benefit.” How often that truth is ignored in parish life! We still tend to operate with a “passive” view of the Catholic laity, the view that the laity’s role is to show up to receive the sacraments while the work of the Church is carried out by clergy and religious. Yet the Scripture insists that gifts of the Spirit are given to each, for the purpose of building up the whole body. Yet the typical parish offers little or no guidance for the typical lay person to identify his or her giftedness, and develop it within parish life. Here is a book that offers some suggestions. This Reading allows the homilist the opportunity to speak about what St. Paul truly taught about the path of salvation, in contrast to what Protestants have traditionally said about St. Paul. As a Protestant pastor/evangelist, I used to visit homes and give “Gospel presentations” where I taught “salvation by faith alone” based on the “Roman Road,” a collection of verses from Romans arranged in such a way as to imply a sola fide path to heaven. But St. Paul does not teach salvation by faith alone! Nor does he teach that we “earn” our way to heaven! St. Paul clearly denies that we can simply “believe in Jesus” and then be saved, no matter how we live. He says above, “If you live according to the flesh, you will die!” By this he means spiritual death! To continue to live in sin will result in eternal separation from God, even if you “believe in Jesus”! How is this not “works righteousness” or “earning our way to heaven”? Because it is empowered by the Holy Spirit! St. Paul teaches that we receive the Holy Spirit from God through faith and baptism. Thereafter, the Spirit truly works in our lives, changing our thoughts, feelings, and actions, so that we truly follow God’s Law (summarized as love of God and love of neighbor) and become acceptable in his sight. There is no salvation apart from the transformation of our thoughts, feelings, and actions—who we are—by the Holy Spirit! There are no shortcuts or loopholes! This transformation is not always pleasant, because it means the killing off of some of our desires, many of which are sinful and unhealthy. Moreover, as we grow in holiness, the world around us doesn’t always appreciate it, and often responds with hostility. Therefore we must “suffer with him, so that we may be glorified with him”! That final verse of this Reading also contradicts any notion of “salvation by faith alone” understood as easy-believism! Sometimes this is called the “Johannine Pentecost,” but it would be incorrect to pit these two events against one another, as if John was of the opinion that the Spirit was given at one time, and Luke of the opinion that it was dispensed at another. In the Christian life, there are certainly definitive giftings of the Spirit (for example, in Baptism and Confirmation, and even in every worthy reception of the Eucharist), but the Spirit comes to us continually, not just once. In fact, Luke does record the same event we find detailed in today’s Gospel Reading, although the fact is frequently missed. In Luke 24:49 Jesus says, “Behold, I send the promise of my Father upon you.” The Greek is present tense: Jesus is giving the Spirit as he speaks, which is the event recorded in John 20. The rest of Luke 24:49 says, “But stay in the city until you are clothed with power from high.” So Pentecost is not the first time the Apostles receive the Spirit. Rather, it is a special dispensation, it is a “clothing with power from on high.” We should understand it as an extraordinary empowerment with authority, gifts and charisms that they will need for their apostolic ministry. As the Second Reading emphasized, there are many gifts and forms of ministry inspired by the same Spirit. Finally, the Gospel Reading emphasizes the coordination of the ministry of the Spirit with the Apostles. John makes the same point as Luke, a point we have remarked on in previous posts. Highlighted here is the essence of what we know as the Sacrament of Reconciliation: “Whose sins you forgive are forgiven them, whose sins you retain are retained.” This emphasizes the purpose for which the Spirit is given: that our sins may be forgiven. Calvin struggled with this verse and ended up arguing that the “forgiveness of sins” referred to the apostles’ preaching. Through preaching sins were forgiven or retained. One can see that interpretation is certainly not the obvious meaning of the text. Perhaps if the entire Church had always understood the verse that way, one could accept it as its meaning. But of course, the Church hasn’t understood it in Calvin’s sense. Like many other passages of Scripture, this was one in which Calvin could not actually live by the principle of “sola scriptura.” When talking with other Christians, Catholics should remember that it is most certainly not a question of “them” (Protestants) taking the Bible “literally,” and “us” taking the Bible “figuratively.” The differences between Catholics and other Christians revolve around which passages are to be taken one way or the other, literally or figuratively. Just as in the first reading, the Gospel reading from John 20 emphasizes the connection of the Spirit with the Apostolic ministry, and by extension, the ministry of those in apostolic succession. There is not a “hierarchical” Church and a “charismatic” Church—there is one Church, and the Spirit moves through her officers. Of course, when her officers resist the Holy Spirit, or don’t manifest the “fruit,” it is a sore trial of faith for the rest of the body, but the answer then is prayer and fasting (Matt 17:21), not schism. In this passage, part of the Last Supper Discourse (John 13-17), Jesus stresses the connection between love and obedience. How do we tell when I person is “filled with the Spirit”? In some groups I have associated with, being “filled with the Spirit” was identified with raising hands in worship and speaking in tongues. Those are good things in themselves, but this passage from John points to a different sign of the Spirit: “keeping the word” of Jesus. Does a person’s life exemplify “keeping Jesus’ word”? If so, it is a good sign that the “Father and Son” have come to dwell with that person. The last verses of this Gospel promise that gift of the Advocate, the Holy Spirit that will “teach you everything and remind you of all that I told you.” Some Christians take this verse as almost a promise of individual infallibility to every believer who will pray for guidance before reading the Bible. The Spirit does guide individual believers, for sure, but let’s remember that the addressees of this promise are, in fact, the Apostles assembled with Peter. We call this the “Apostolic college,” which is still with us, and takes visible shape when the successors of the Apostles gather with the successor of Peter (in a Synod or Council). So gathered, they represent the universal (in Greek, katholikos) Church. And it is to the universal (catholic) Church that Jesus gives this incredible promise that the Spirit will “teach you everything and remind you of all that I told you.” Thus, in the decisions of the Church’s councils as well as in the teachings of the saints through the ages, who have been recognized for holiness by the whole Church, we have rich testimony to the Spirit’s teaching through the ages. In fact, the Catechism is a great condensation of the Spirit’s voice to the Church, “teaching and reminding,” through history to our present day. There still may be space to visit the Holy Land June 26-July 5 with myself and Fr. Denny Gang, TOR. We will have an exclusive day dedicated to the Dead Sea Scrolls, including meeting with the family of some of the discoverers of the scrolls. Click here for more information.